Horror authors branching out and writing crime is not a new thing. However, given the differences between the genres, I'm a bit worried every time a horror author whose work I enjoy decides to change supernatural elements for guns. Sure, writing chops are writing chops regardless of genre, but treating each with the knowledge and respect they deserve is a different thing. John F.D. Taff is an outstanding voice in horror fiction, but when he published Kill/Off, his first crime novel, I felt the usual doubts creep in. Luckily, Taff delivered a great narrative packed with suspense and hidden agendas. David Benning is regular guy with a money problem. His father suffers from Alzheimer's disease and keeping him in a place where he'll receive quality care is very expensive. To get the cash, David has been stealing from his office. Unfortunately, someone knows, and they use the information, along with his father's situation, to blackmailed him. A shadowy organization known only as The Group starts giving David a few jobs, and they all involve murdering people. Fearing for his father's well-being as well as for his freedom, David is thrown into a dangerous world of guns, ominous envelopes and packages, and murder. The more he deals with The Group, the more he learns about it and the motives behind the killings. But knowledge always comes with a price. Taff does many things right in Kill/Off. For starters, he takes his time building the narrative, so by the time everything is in motion, every situation is believable and the reader already cares about David. The second thing is David himself: he's a good guy with good intentions who's caught up in very ugly circumstances, a likeable character that puts killing for money under a very different light. Last but not least, the prose itself is what makes this one a recommended read. Taff's writing is pulp with a literary flair, and his horror skills come in very handy when it comes to things like describing violence and the effects of bullets on human bodies. "Would you kill a person if you knew you could get away with it?" This is a question the narrative repeatedly comes back to. It is also a question the story forces the reader to ask him or herself. The answer should be this: if I was in David's situation, I probably would. 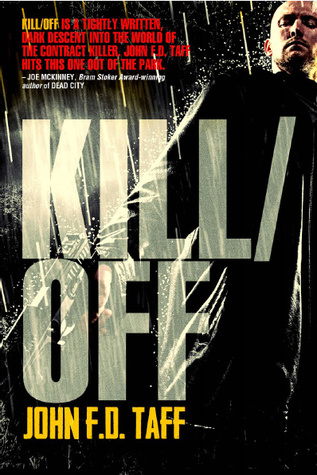 Kill/Off is a fast-paced read that offers a new and interesting look at the world of contract killing. It's also a great crime debut from an author who can definitely deliver regardless of genre.